If you consider your pet family, like most of us do, then it is important you give them the best care you possibly can just like you would your own child. 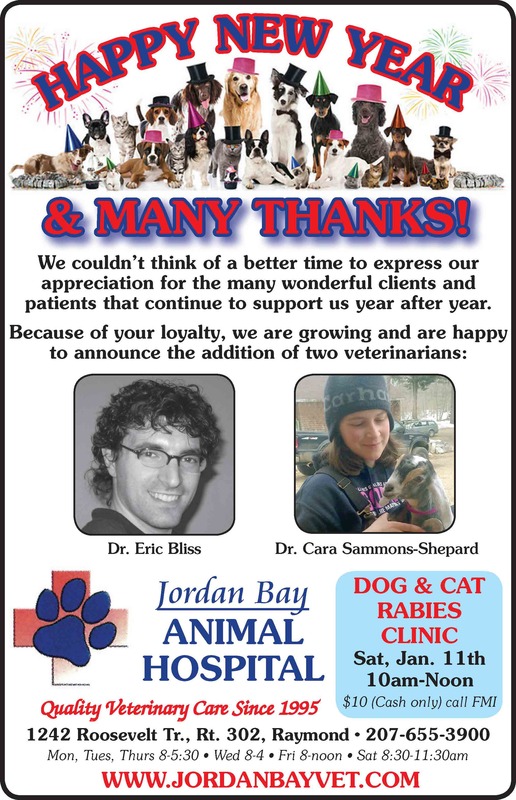 Dr. Eric Riddell and the staff at Jordan Bay Animal Hospital on Roosevelt Trail in Raymond has a reputation for compassionate and professional care you can trust. Since taking over the practice in 2006, Dr. Riddell has provided care for thousands of animals that include dogs, cats, rats, guinea pigs and other small animals. The philosophy, which is “love is practiced and spoken here,” transfers through everything they do at the clinic from teeth cleaning to vaccinations. Dr. Riddell describes himself as a generalist. He takes care of most issues an animal might have, but he has also surrounded himself with specialists all over New England, so that within days or even minutes using telemedicine, he has a consultation on a case. This saves customers money from a visit with a specialist and keeps the animals closer to home. However, unlike some facilities, Riddell makes sure that the animals have personal care throughout their visit. When animals must have surgery, a technician will join a dog in a cage or sit with a cat before and after the procedure. “They know they are loved and cared for,” said Kim Riddell, practice manager. Some advanced diagnosis’ require that pets be referred out of the clinic. However, Dr. Riddell has specialists that he trusts and works closely with in New England. Records and tests can be sent out to other facilities digitally to assist other doctors. The office has a friendly, comfortable ambiance. There is always an animal movie playing in the waiting room and the wall is covered with pictures of the many furry friends who come to the clinic. The practice pretty much does it all and is slowly growing in such a way that customers and animals come first. “That’s why we are here,” said Kim. In the next year, they are hoping to expand the practice to include another veterinarian and more technicians. The practice has a full lab for blood work and urinalysis work. They also provide dentistry including extractions. The clinic has a full surgical suite, digital radiology and a state of the art therapeutic laser for non-invasive pain treatment that helps with wounds, aches and fractures. The therapy also can help rescue dogs learn socialization and can comfort all pets. The hospital also offers prescription diets and supplements for certain animals. “With everything we do here, we try to make it as careful as possible,” said Riddell. The office is paperless and does all records electronically. They communicate by email and Facebook for daily announcements and reminders for pet parents. “He is very big on education and communication,” said Kim. The office uses Pet Portal, which allows owners to check on charts, medications and send questions for the doctor. They also have several articles on their website to help educate clients on various conditions, tips on how and where to choose your pet, a vetopedia which is a glossary of terms used by vets and more. “We wanted to do things in a way that provides service, supports people and their animals and provides a place people look forward to come to work at,” said Kim. At Jordan Bay Animal Hospital, they don’t cut corners. They do what’s best for the animals, even if it might be an extra step or two. Puppies should have a series of vaccinations and senior animals should have a baseline of blood work done. Pets should be seen at least once a year for annual shots and a checkup. Jordan Bay Animal Hospital will be holding a rabies clinic Saturday, January 13, 2018, at 1242 Roosevelt Trail in their office. Vaccinations are $10, but smiles are free. Jordan Bay Animal Hospital is open from 8 a.m. to 5:30 p.m. on Mondays, Tuesdays and Thursdays, Wednesdays from 8 a.m. to 4 p.m. and Saturdays from 8:30 a.m. to 11:30 a.m. For more information, visit www.JordanBayVet.com, call 207-655-3900 or find them on Facebook. 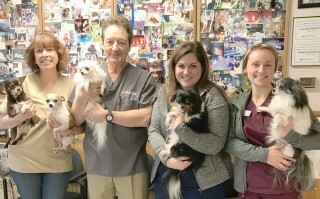 Picture caption: (L to R) Kim Riddell, Dr. Eric Riddell, Jessica Sollenberger and Carey Gayton stand with some furry friends in front of their wall of satisfied customers. Missing is Maggie Wood. Michelle Libby photo.